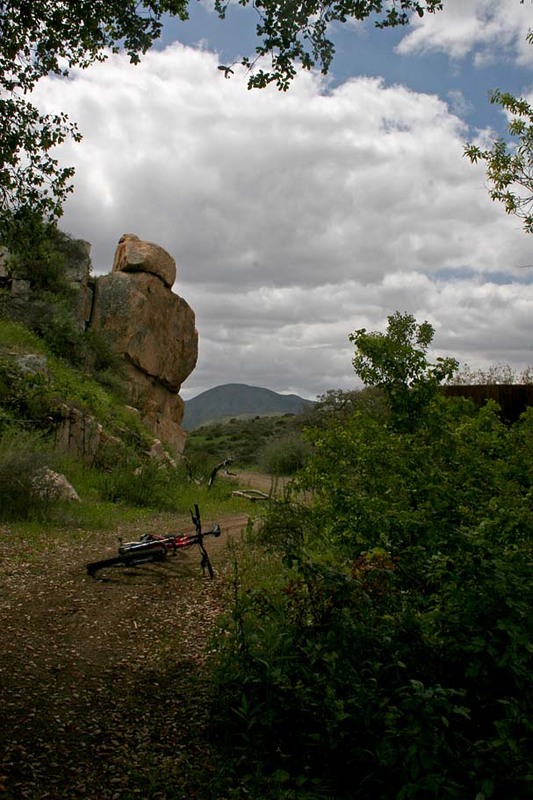 Located out in the eastern part of San Diego County near the small rural community of Jamul, this small canyon preserve offers a nice mixture of varying aged fireroads and bits of singletrack along both Hollenbeck canyon as well as the adjacent canyons and meadows. 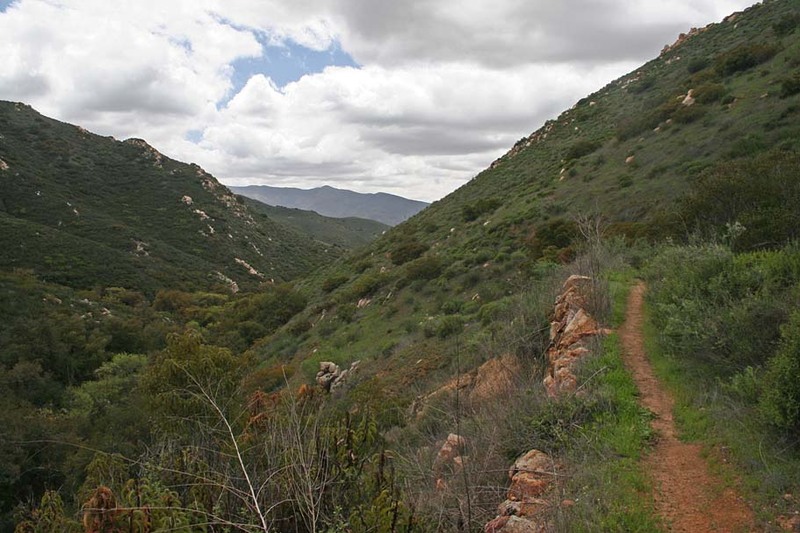 You can put together between 10 to 14 miles of trails fairly easily with the potential for much more mileage by venturing out of the Hollenbeck Canyon area on several of the fireroads that goes beyond this area. The letters on the map are referenced in the ride notes. HAZARDS: This place can get seriously hot during the summer. There is only a spot of two of exposure in this area and you would have to really get off of the line to get into trouble, but if you did you could really be bumming. 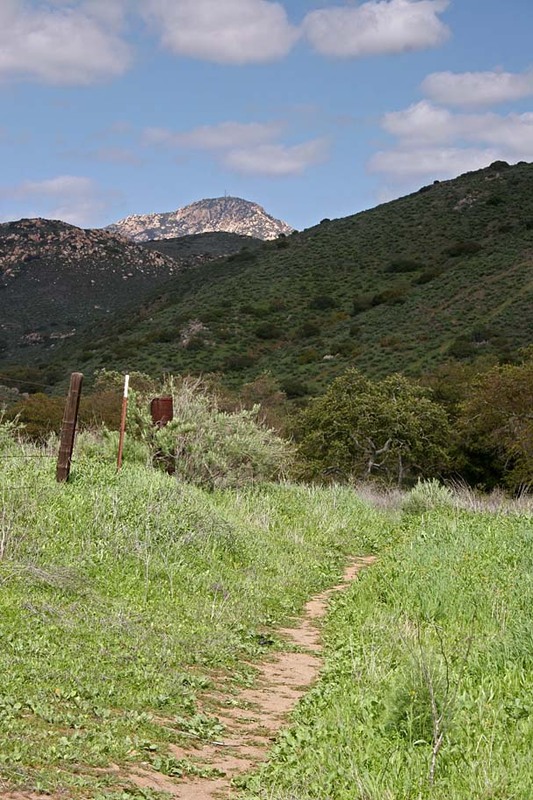 Directions: Hollenbeck Canyon can be a little interesting just getting to the trailhead. 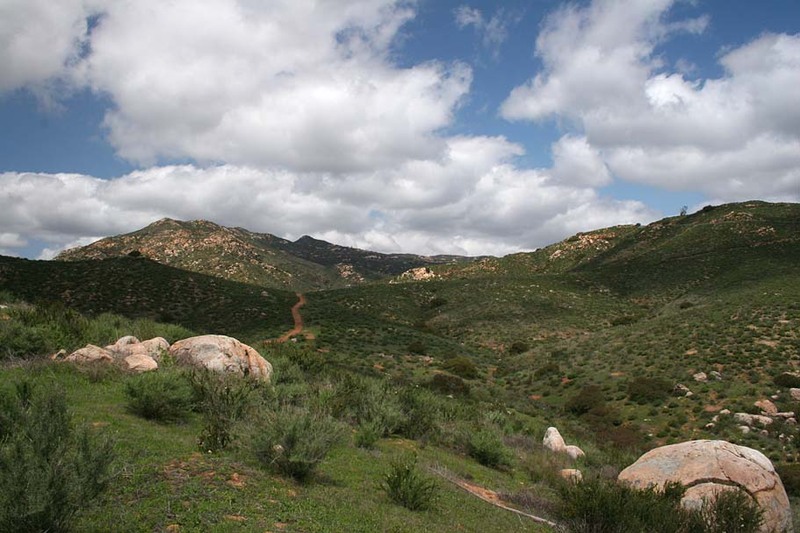 From areas north of San Diego: From the Intersection of I-15 and I-8, take I-8 east 5.7 miles. Take the SPRING ST exit toward DOWNTOWN and stay in the right-hand lane to go onto Spring St. Take Spring St 1.3 miles and merger onto CA-94 East. 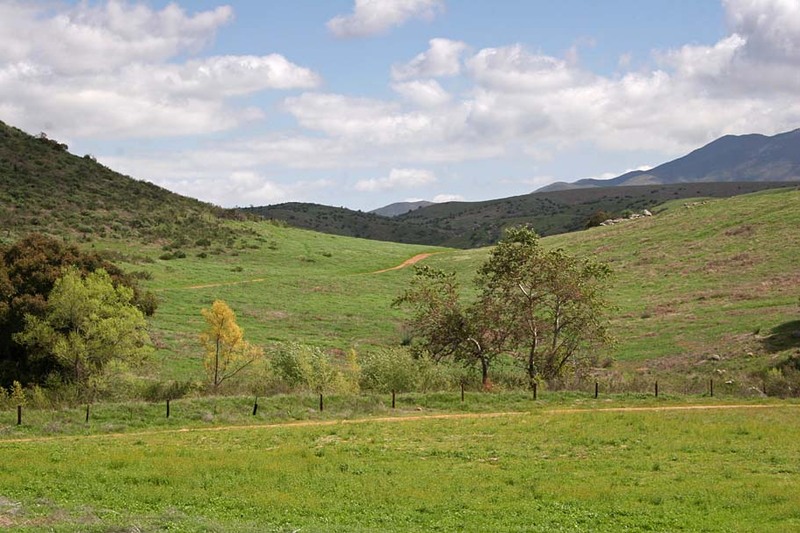 After 4.5 miles when the large portion of highway ends, turn right onto Campo Road/CA-94 and travel 8.9 miles (and passing through the town of Jamul) and turn left onto Honey Springs road. The trailhead is immediately on your left. From the South Bay, National City, Chula Vista Area: From the I-805, Take the L Street/Telegraph Canyon Road exit in Chula Vista and head east on Telegraph Canyon Road. 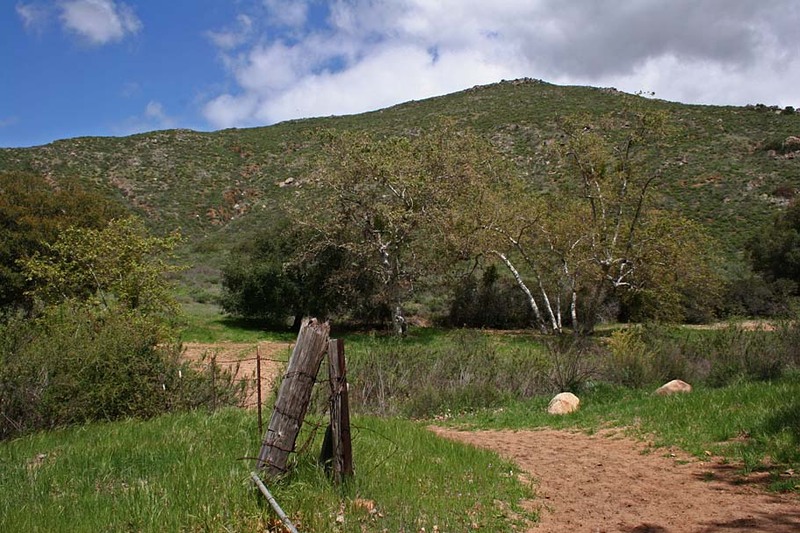 After 3.6 miles, Telegraph Canyon Road turns into Otay Lake Road. Continue another 12.2 miles until you come to a T-junction with Campo Road/CA-94. Turn left and onto Campo Road and take your first right about .5 miles later onto Honey Springs Road. The trailhead is immediately on your left. Ride Notes: Photographic Notice - I took these pictures during the height of spring and my guess is that this area is only this green for a month or so out of the year. 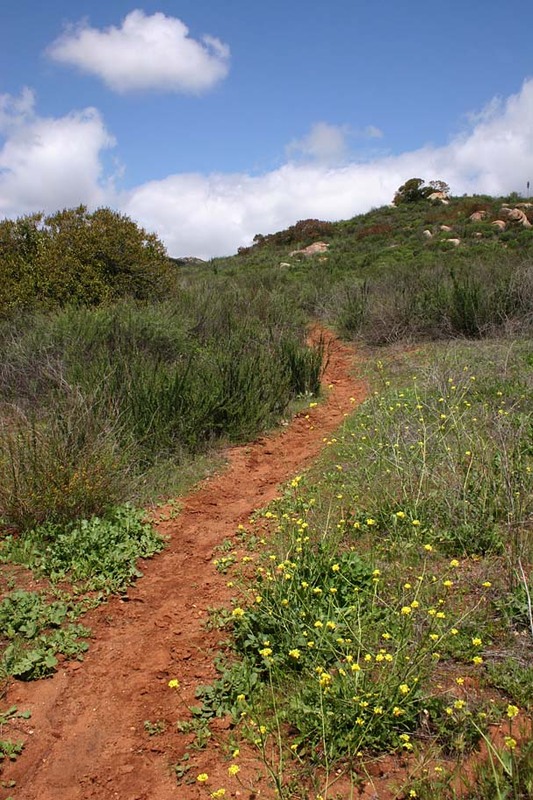 This trail was burned in the 2007 Wildfires but the trail has been recovering nicely. From the trailhead there is really only one way to go along a well defined trail that will most likely show some wear from horse traffic. 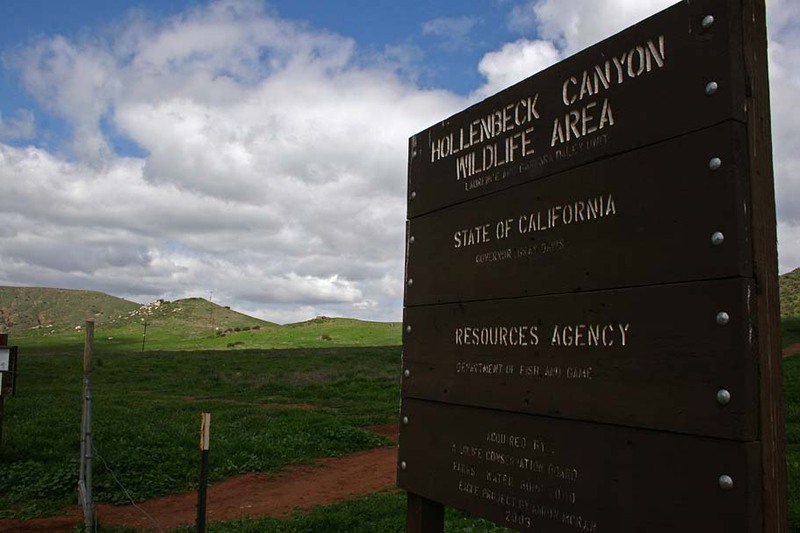 At .2 miles you will some over a small saddle in the hill where you will find a marker for the California Riding and Hiking Trail (CRHT) which goes through Hollenbeck Canyon. Statewide, the CHRT is marked by brown posts with a yellow painted caps. 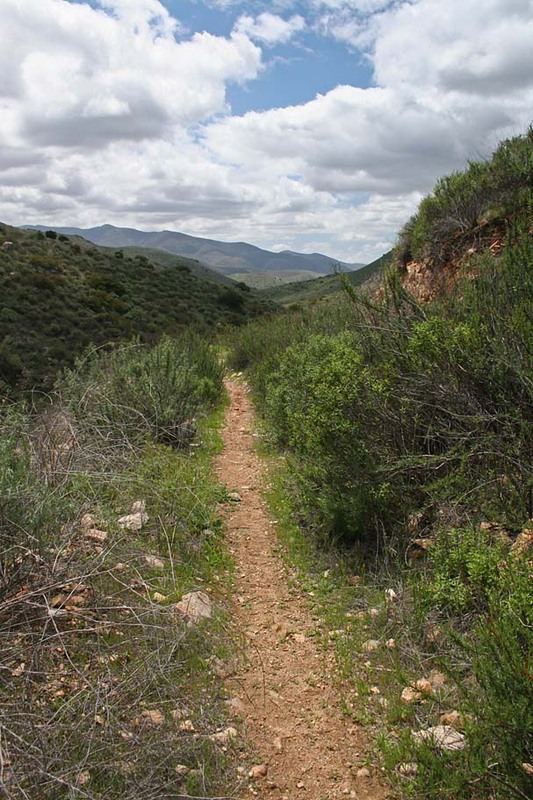 The trail goes nearly the entire length of the state and while it does not get the good public relations bit that the Pacific Crest Trail does, the CHRT is open to Mountain Bikes (at least on non-wilderness land). Here is the TOPO! file showing the CHRT route through San Diego County. About .5 miles from the trailhead you will come to a wash crossing where you can either cross the wash and turn right on the fireroad, or you can catch a singletrack just before and off to the right of the crossing and follow it for about one hundred yards or so before crossing the wash and rejoining the fireroad, where you will turn right and continue up Hollenbeck Canyon. These pictures were taken near Point 001. The climb from Point 001 to Point A is quite mild along a fireroad that is quite often shaded. 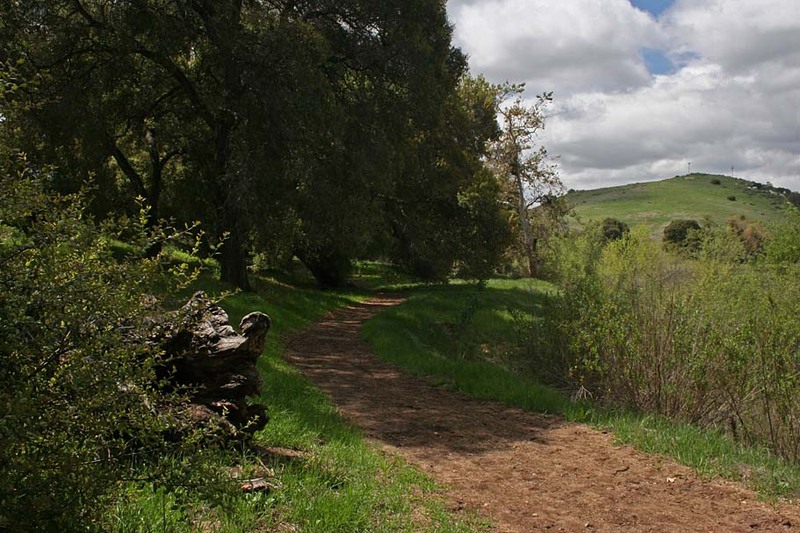 At 1.6 miles, just at as the climb starts to get steeper, you will see a singletrack going off to the left and uphill. If you are trying not to double up any trails out here this may be a little tough to put this trail into the loop without paying the gravity gods. I climbed this trail and it was quite strenuous. Next time out, I will most likely go about 100 yards further up the trail where the fireroad turns left and up a steep hill. Also right at the bottom of this steep hill is a singletrack that stays down in the canyon heading north (Point B on the map). 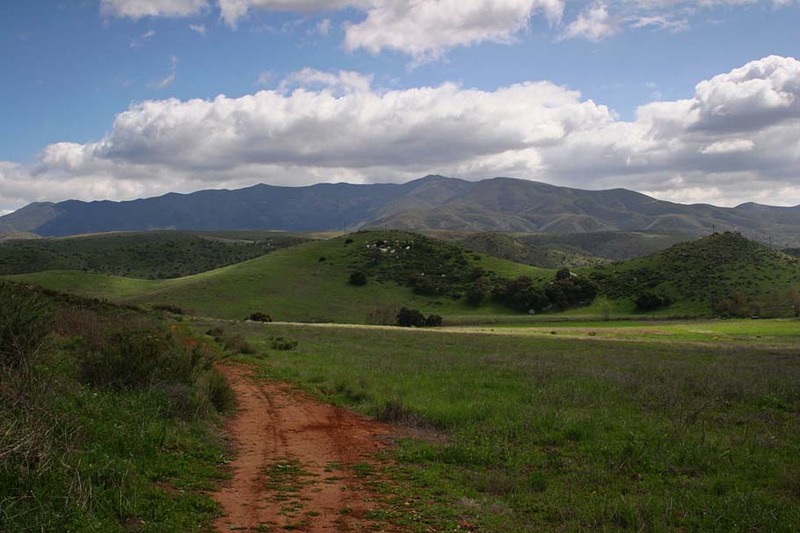 I would grunt up the fireroad and catch the singletrack and the top of the hill and take it downhill back to Point A. From there turn left on the fireroad again and pick up the singletrack heading north through Hollenbeck Canyon towards Point B. These two picture were taken near the top of the single track described above. The picture to the left is looking down and to the north at the Hollenbeck Canyon trail between Point B and C. The picture to the right is from the same general area looking towards Point D.
The singletrack between Point B and C is quite nice with a bit of exposure in a couple of spots along with some nice close-in canyon views. While this section is fairly short at only .8 miles long, it makes up for it by being fairly skinny. This trail ends in a T-junction at Point C. If you turn to the right you will cross a creek and then up a small rise to an open area where the petro-toy types have created a playground of jumps and berms. There appears to be huge opportunities to add mileage if you follow the trail/fireroad beyond the playground up hill and to the east. 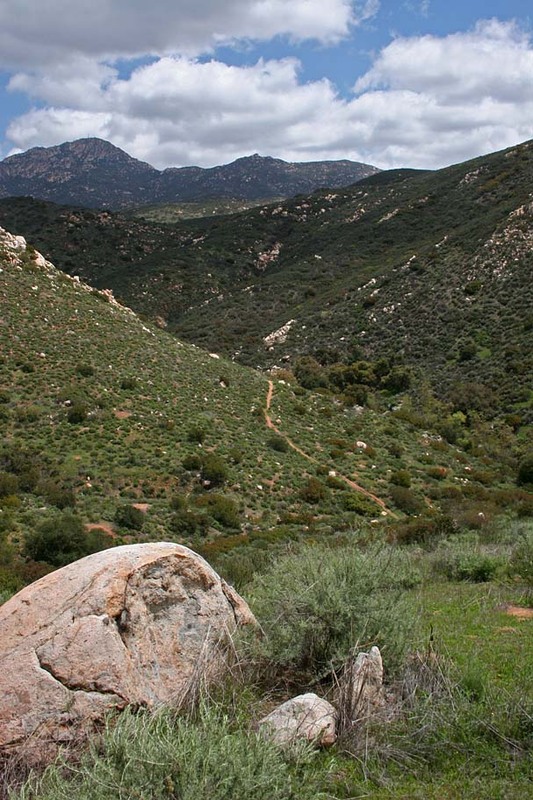 The upper end of Hollenbeck Canyon approaching Point C.
If you are not going to explore to the east, turn left and grunt/hoof your way up a rocky and sometimes loose climb that is only a 1/4 mile long but has a lung busting, quad-burning 17% grade. 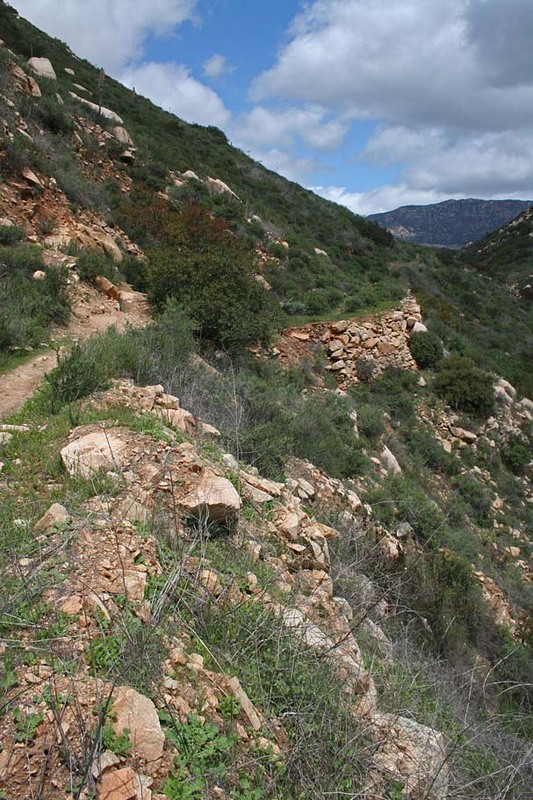 The top of this climb comes out onto a well defined fireroad at a switchback. 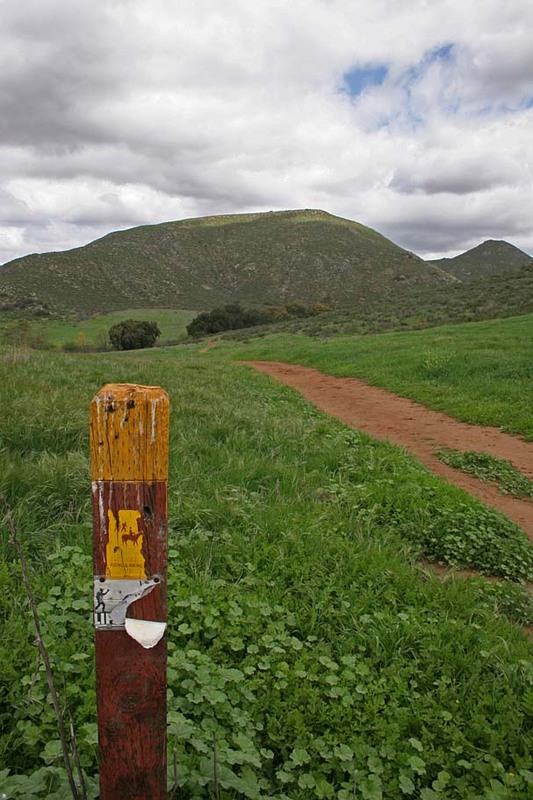 Turn right here and continue uphill while taking in some of the views of the Jamul Mountains off to your left with San Miguel Mountain off in the distance. The best view is from Point D which about 1/4 mile from where you joined the fireroad. 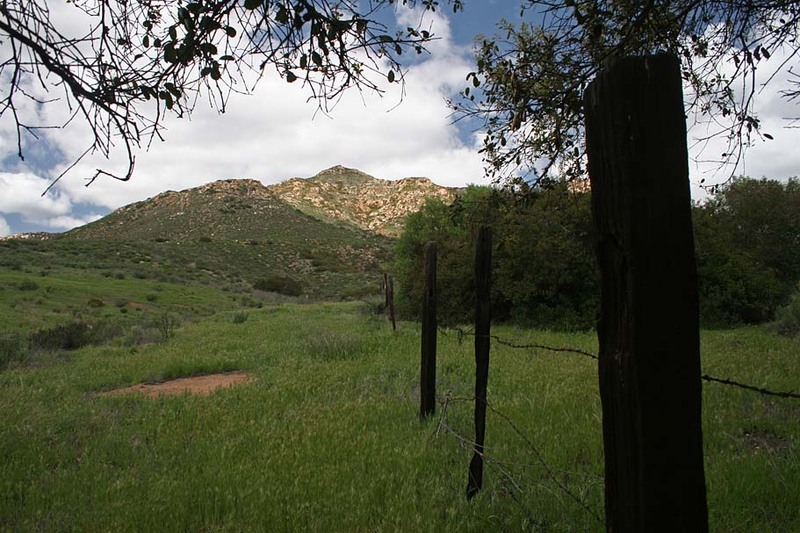 The view of the Jamul Mountains with San Miguel Mountain in the distance from Point D.
Continue along this fireroad where a little over a 1/2 mile after you joined it at the switchback it will turn downhill. 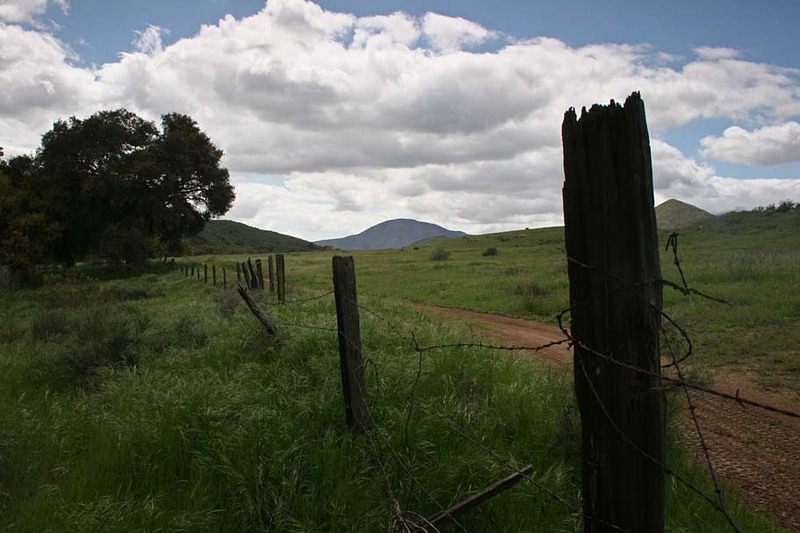 Shortly after that you will go through or around a gate and continue along the fireroad. At 1.1 miles from where you got on this fireroad, look for an old fireroad turning off the left just as the fireroad you are on starts to turn slightly uphill at Point E on the map. The next 1.3 miles is quite a bit of fun on a old fireroad that has for the most part has been reclaimed into singletrack. 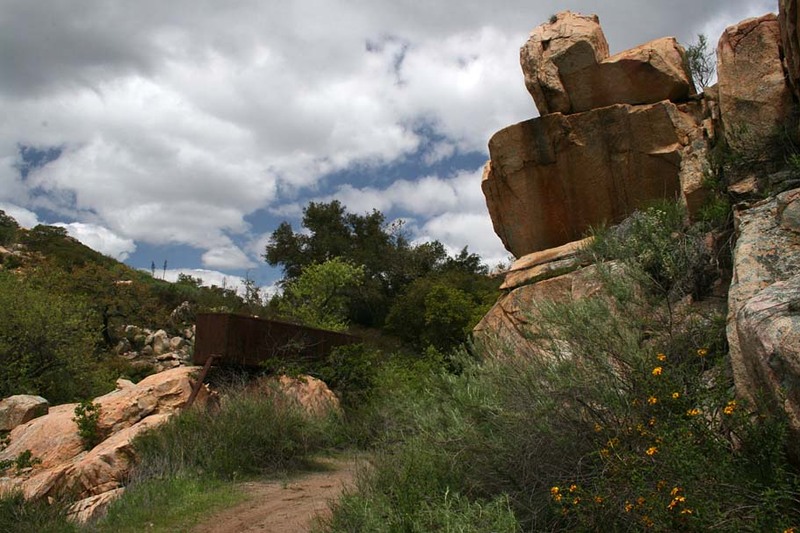 It drops down into the canyon that Jamul creek runs through which is created by a natural spring near this area so you will have a couple of stream crossing. 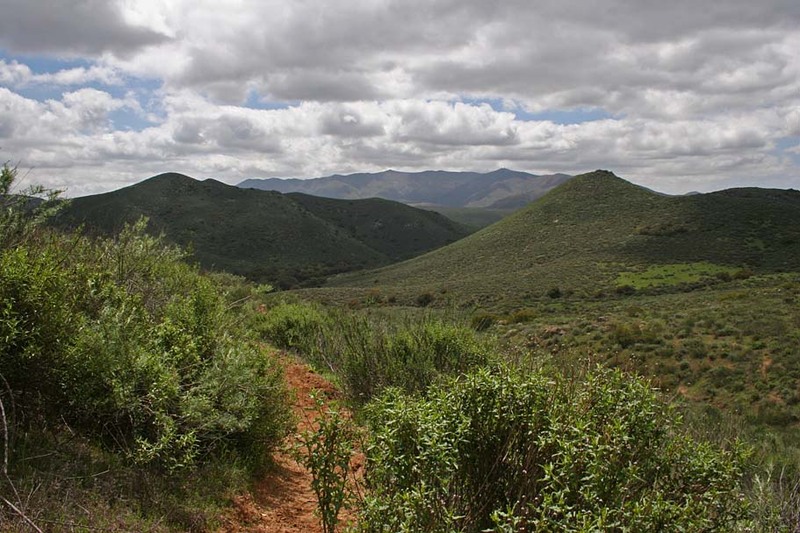 There is really not much in the way of views around the trail in the upper portion, but at the speeds you can reach you would not have time to look anyway. 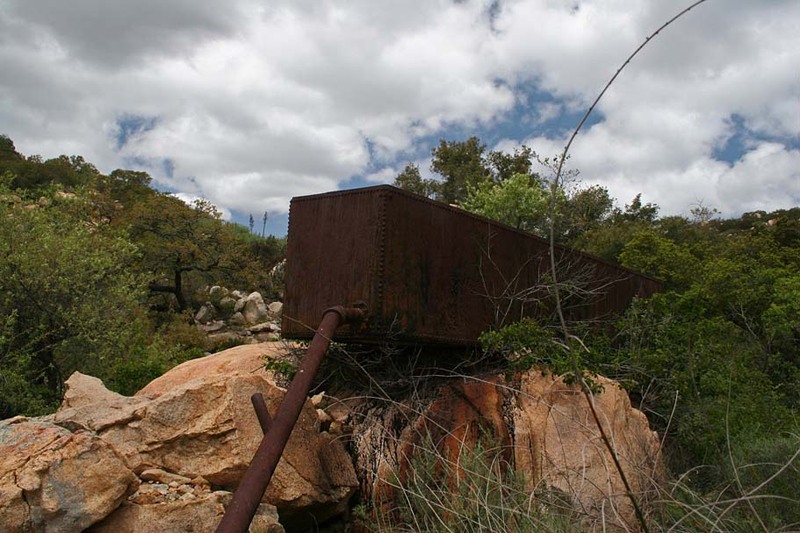 As you approach Point F along this trail the views open up and you will see an old rusted metal box sitting on top of some boulders. This appears to be some old attempt to siphon off and use the spring. You can see broken pipes near the box that has long since abandoned. There is ample shade in this area and it is a good spot for a break. 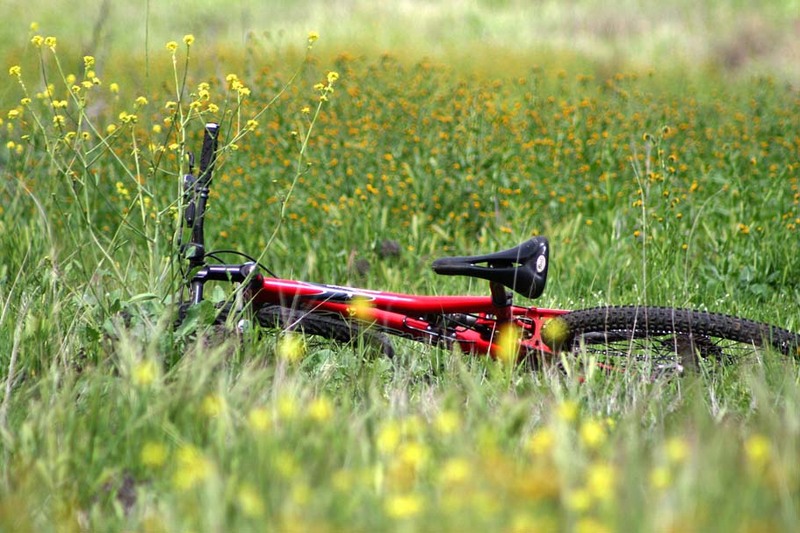 From Point F you will cruise downhill until you merge right onto a fireroad and continue cruising downhill until it almost flattens out at Point G where are are now riding along the edge of a open meadow. 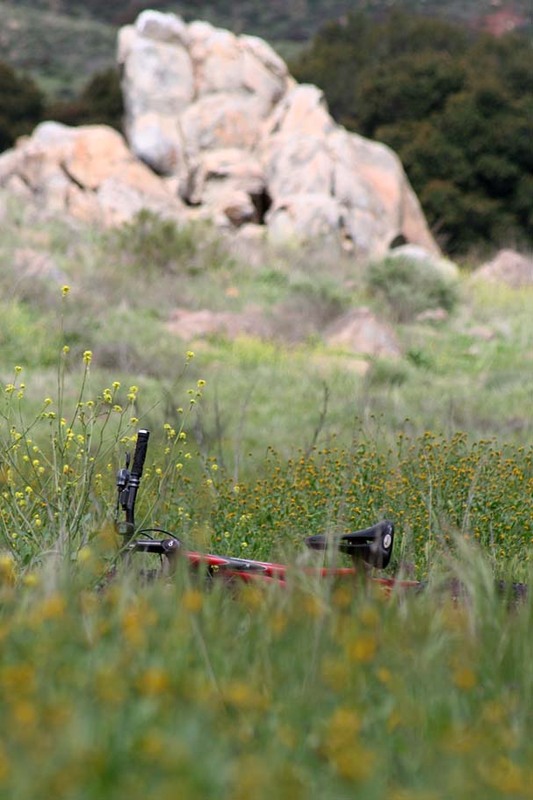 Be on the lookout for a break in the barbed wire fence on your left with a singletrack going through the opening. This is a short singletrack but in goes through a somewhat mature oak grove that was just spectacular during my spring ride through here. That pan shot below is almost a 180 degree view. 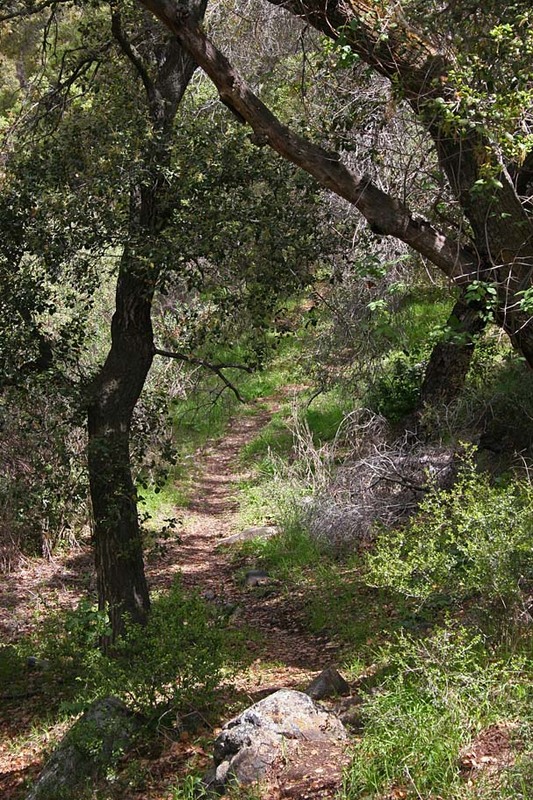 The singletrack through the oak grove between point H and point J. From Point J, I did a little exploring to the north and found that there were singletracks going along both sides of the meadow between the hills. 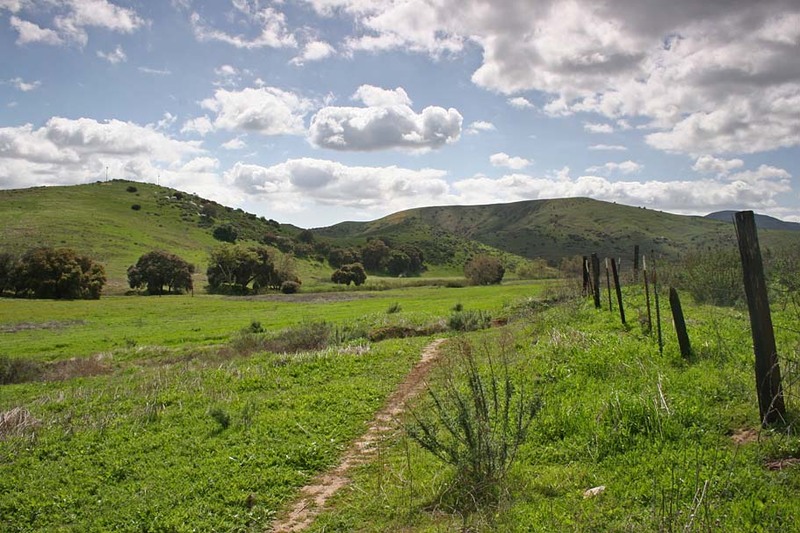 They were quite skinny and I was unsure if they were designated trails or not so abandoned the snooping and headed south, looped around a hill to the south to Point I. 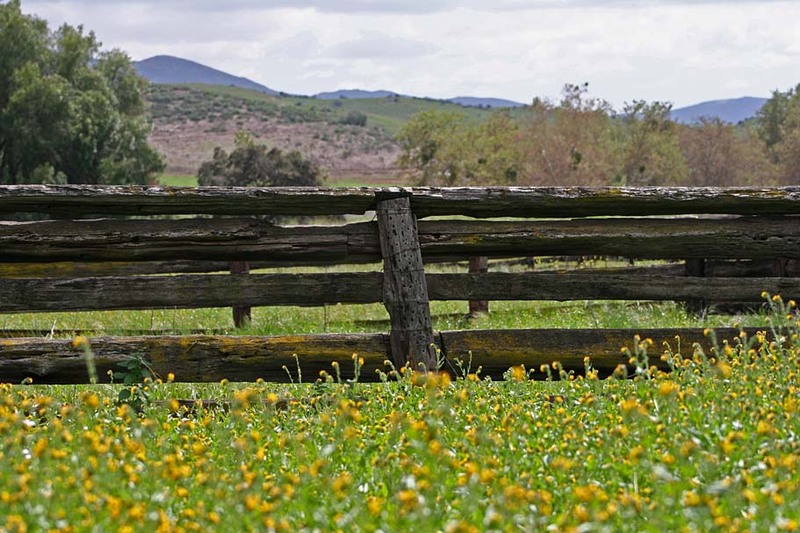 Near Point I are some old fences and corrals that are interesting to roll through and I even jumped a couple of deer in the middle of the day. 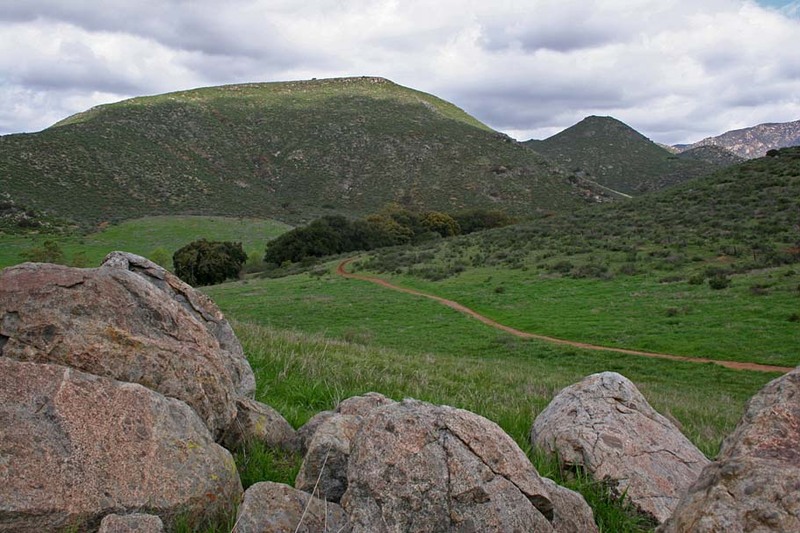 After snooping around in this area, I worked my way back from Point I back to Point J and then followed a foothill trail along the edge of a large meadow until I was back at the Point 001 were I had originally headed split off north to go up Hollenbeck Canyon. I retraced my route back to the trailhead from here. All together that day I got in about 16 miles but I did do a little doubling back in my exploring efforts. If you follow the route I described, you are looking at around 14 miles, but you could get much more miles than that. 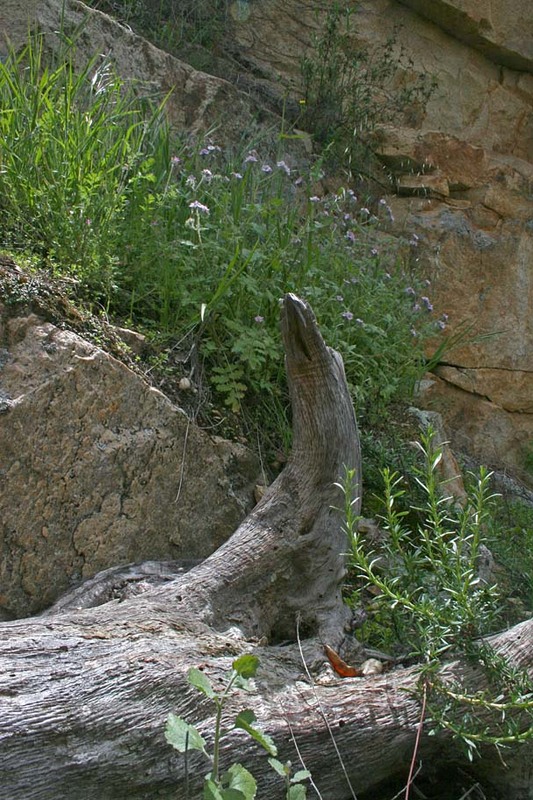 I am sure there are more trails to find out there, particularly if you head east from Point C..